Learn from the source – with highly skilled and experienced Chinese Masters, experts in martial arts and Tai Chi, Grand Master Eng Chor Khor and Senior Master Chin Min Lian. Learn with well-trained quality Instructors who keep enhancing their skills guided by the Masters in regular professional development training. Enjoy Tai Chi practice in fresh air with other learners from many Celestial College Centres and free park lessons across Melbourne. 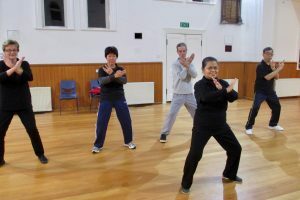 Explore and hone new Tai Chi and Qigong skills and forms in specialised workshops with the Masters. Gain valuable knowledge of Tai Chi, Qigong and Chinese culture in free Q&A sessions with the Grand Master. Choose a class that suits your needs and goals best from many suburbs in Melbourne. Learn with us, a highly respected team of expert teachers sought after by many companies, organisations, retirement groups, councils, charities and sports centres whose events we generously support. Take part in special events with us, such as, Moomba, Ashburton and Moonee Ponds Festivals, Chinese New Year in Box Hill, Relay for Life, Peter Mac and Alzheimer Programs. Enjoy being part of the Celestial College community with its long history of almost 3 decades of teaching Tai Chi and Qigong in Melbourne. Choose your class location, but remember that you can always change it to continue what you started or to make up for missed lessons. You can easily move to any of our different centres across Melbourne, if you wish, to enjoy a variety of individual teaching styles and techniques or a different environment and enrich your experience – flexibility and diversity are our strengths. Delight in annual banquet performances by the Masters and Instructors, celebrating the exercise art of Tai Chi and Qigong.